Census Bureau data released yesterday show that poverty in California remains high. Our brief report on the new Census data shows that the share of all Californians with incomes below the federal poverty line in 2013 remained significantly higher than in 2006, the year before the Great Recession began. More than 5.6 million Californians — over one in seven — had incomes below the poverty line in 2013. What’s more, nearly 2 million California children were living in poverty in 2013. Although the state’s child poverty rate — 20.3 percent — is down significantly from that in 2011 (24.3 percent), children still account for a disproportionate share of Californians living in poverty. 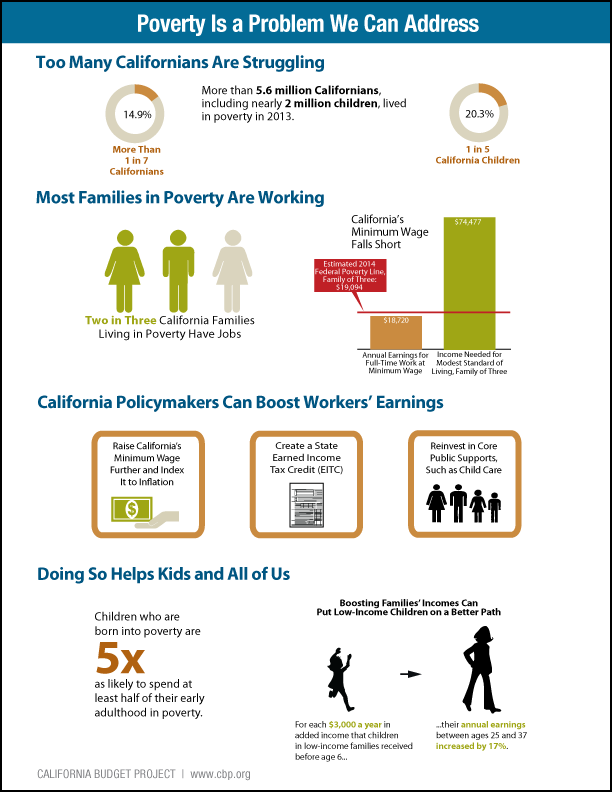 This CBP infographic (below) highlights the new top-level poverty data from the Census and shows why state policies that boost workers’ earnings can play a major role in reducing poverty and fostering greater economic opportunity across our state. A full-size (PDF) of this infographic is available here. A new report from the University of California, Berkeley’s Institute for Research on Labor and Employment (IRLE) estimates the public costs of low-wage work in the fast-food industry. In doing so, the report highlights a key and underdiscussed point about low-wage jobs: They don’t just have an impact on the workers themselves; they have an impact on everyone. The authors estimate the financial costs of providing critical public services to workers who cannot make ends meet because of low wages, insufficient hours, or inadequate access to health care benefits. The study estimates that nationwide, the public costs of providing health care, nutrition services, and cash assistance to fast-food workers amount to nearly $7 billion per year. The report also busts some pervasive myths about who low-wage workers are. As we have noted in the past, low-wage workers are not just teenagers employed in their first jobs. As the IRLE report points out, more than a quarter of fast-food workers have children, while employees who are younger than 19 years old and living with a parent represent 18 percent of fast-food workers. Overall, for more than two-thirds of fast-food workers, their wages are an essential part of their total family income. Finally, the IRLE analysis provides further evidence that the recently enacted increase in California’s minimum wage, which takes effect next summer, is good policy for the state. The typical front-line fast-food worker in the US earned $8.69 an hour in 2011, far below the national median wage of $16.57. By this time next year, fast-food workers in California will be earning at least $9 an hour, and by 2016 they will be earning at least $10 an hour. This wage increase will be a critical boost in income that will help workers provide for their families and bring food to the table. California’s low-wage workforce just got some much-needed economic relief yesterday. The Senate and Assembly passed Assembly Bill 10 (Alejo), which incrementally raises the state minimum wage from today’s $8 rate to $10 by January 1, 2016. The final version of AB 10, which Governor Brown has indicated he will sign, results in a more timely increase in the minimum wage than the previous iteration of the bill. That version, from June of this year, would not have raised the minimum wage to $10 until January 2018, more than four years from now. With this faster timeline, California’s minimum wage will more effectively regain purchasing power lost over recent years as the cost of living has increased, and will give low-wage workers a critical boost in income. As the following chart shows, by 2016 the value of California’s minimum wage will be the highest it has been since 1979. The need to increase the minimum wage is an issue we have discussed in the past, and the final passage of AB 10 is good news. It comes at a critical time when low-wage workers have seen their wages stagnate or decline in recent years. Last year, the purchasing power of wages for the bottom fifth of California’s earners remained virtually unchanged from 2011 and well below pre-recession values. In other words, as the cost of living has increased, these workers’ wages have not, placing additional financial strain on families who are still recovering from the worst economic downturn in generations. It is important to note, however, that AB 10 is just one of many steps that California must take to ensure that the economic recovery — as well as the state’s long-term economic growth — benefits all workers. Looking forward, the state must continue to invest in its workforce, such as by improving access to higher education — which is critical for any state’s overall prosperity — and ensuring the availability of child care and other supports that workers and their families need to secure good jobs and move up the economic ladder. On Monday, the Senate Appropriations Committee will consider Assembly Bill 10 (Alejo), which would increase California’s minimum hourly wage — currently $8 — in annual increments until it reaches $10 in 2018. Since it reached the California State Senate, AB 10 has been amended to remove a provision tying the minimum wage to inflation, which would have resulted in modest increases in hourly pay to keep pace with the rising costs of living. Even without this provision, however, an increase in the minimum wage is good policy for California’s economy. Such an increase is long overdue and will provide extra financial security for California’s workers. A minimum-wage increase would come at a crucial time for California’s low-wage workers, who generally have seen their earnings decline in recent years. Between 2006 and 2012, inflation-adjusted earnings for the bottom fifth of California earners declined by almost 6 percent. Furthermore, inflation has eroded the purchasing power of California’s minimum wage over the past four decades. Despite occasional increases in the minimum wage, the 2013 purchasing power of California’s minimum wage is nearly one-third below its 1968 value. A minimum-wage increase would help workers of all ages and levels of educational attainment. Contrary to an often-repeated myth, workers earning minimum wage aren’t just teenagers who are entering the workforce for the first time. In 2012, nearly half of those earning up to the federal minimum wage nationally were over the age of 25, while more than 40 percent had at least some college education. And minimum wage increases don’t just raise the pay of minimum-wage workers — there is often a “spillover effect” for other low-wage workers already making slightly more than the minimum. Thus, an increase in the minimum wage would benefit a large segment of the workforce, one that California needs to succeed in order to drive the state’s future economic growth. Raising the minimum wage is essential to improving the economic security of California workers, and Monday’s committee vote is a crucial step.